Oreo is an 11 year old male and has been a very active loving dog and his health as been excellent up to now. One day we noticed he seemed to be limping and on another day he was unable to jump up or climb up the stairs. Now he has trouble getting up and seems to be in pain when he walks and we are planning on taking him to the vet tomorrow. We are concerned if this could lead to having to put him down if his condition gets worse. As Oreo dog is nearing his 'winter years' his reluctance to go upstairs or jump may be a sign of joint problems. Or, if he's a very active dog, jumping for balls etc., he may have a torn ligament. It could be degenerative joint problems because of his age, arthritis or osteoarthritis perhaps. He may have hip dysplasia which would cause him pain if he tried to jump or run up the stairs. Any of the above would cause the symptoms you now see in your dog, but this is all guess work. I'm glad to hear you're taking Oreo to see the vet because that's exactly what I'd advise. Depending on what it is, and the severity of the problem, your vet may first look at Oreo's diet and make sure he's not overweight as any extra weight can put an awful strain on our pet's joints. Also, fat can cause inflammation in the joints, so if your dog loses weight (fat) any inflammation will decrease as a result. He may prescribe anti-inflammatory treatment or pain killers. If the problem is advanced, he may recommend surgery or physical therapy. My cocker is only 7, but I make sure he gets plenty of fish oils and gets a fishy treat at least twice a week. As he's been neutered, I watch his diet like a hawk. I feed him with a 'light' kibble specially formulated so that he won't gain weight. Prevention is often better than the cure, but as our dogs age there isn't really much more we can do other than to take good care of them and love them, is there? Please don't worry too much, I'm sure your vet isn't going to put him down, but will sort him out for you and get him back to his old self again. 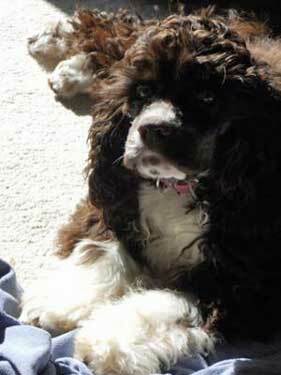 Hi, I've read the previous comments from two different owners of their cocker spaniel, and my Koco (female--5 years old) is experiencing the same issue with her left rear leg. Thank you for providing this platform to share issues pet owners are experiencing; knowledge is power! Milo is 6, and for the past 2 weeks he has been limping and keeping all weight off his left leg. But... when it started it was for 4 days and then went away now Ives is doing it again. I'm able to touch the left leg and looked at his paws which he is not distressed when I do so. Any ideas of what to do!! I have a vet appointment but not til 2 days!!! Could it be hip displacia? I've read about this, (although I don't have any real experience of it) but I understand cocker spaniels can suffer from it later on in life. It's where there back legs and hips cause them problems, pain and difficulty in walking. You often see this condition in Alsatians too.